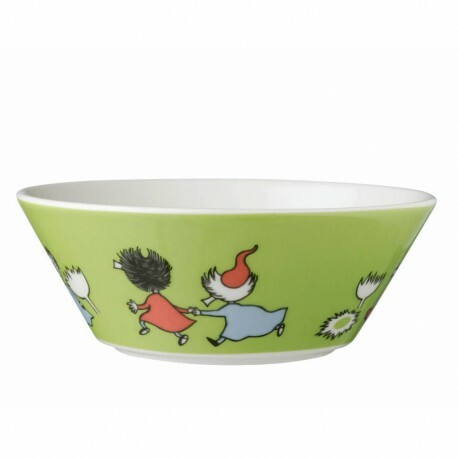 This green Moomin bowl by Arabia features the cute Thingumy and Bob. It’s beautifully illustrated by Tove Slotte and the illustration can be seen in the original book ”Finn Family Moomintroll” by Tove Jansson. Two little creatures who turn up in Moominvalley with a large suitcase, which contains the King's Ruby. They speak a strange language (with "-slan" appended to the ends of some words in the Swedish original, which became spoonerisms, e.g. :"'Man you cake it out?' asked Thingumy. 'Mot nutch,' said Bob", in the English translation) and are pursued by the Groke who wants the contents. They upset Moominmamma by stealing her handbag. They eventually return it and the whole family throws a party to celebrate. The Hobgoblin arrives when Thingumy and Bob open the suitcase, exposing the King's Ruby for all to see. They didn't give him the ruby, but when the Hobgoblin gave everyone there a wish, then they wished for the Hobgoblin to have a ruby as beautiful as theirs; the Queen's Ruby.